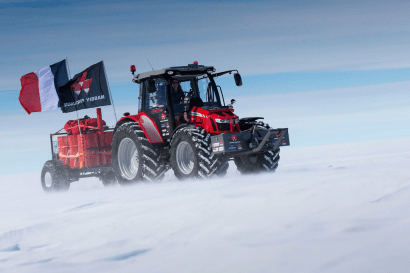 As the snow begins to melt, and the weather starts to warm, the highpoint of the travel season is just around the corner and your desire to get out and explore grows more persistent. Excuses are far too easy to come by, often times manifesting themselves into a few stereotypical responses, like the frustrating concern of not having the “right” vehicle. 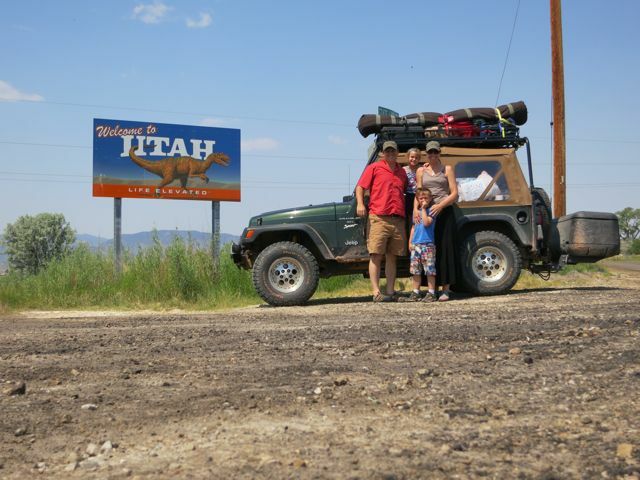 So, against the recommendations of several overland travel “professionals” we started a 30 day, 5,500 mile adventure with a two-door Jeep Wrangler TJ, by the way, we had four people in it! Unlike the newer Wrangler JK Unlimited models, the 1997-2006 Jeep Wrangler TJ simply has two doors, two front seats, and bench seat in the back with a slim 11.3 cubic feet of interior cargo space. 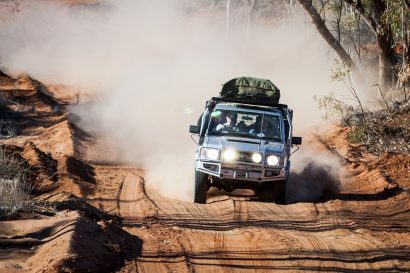 It is the extremely small cargo space that has kept the two-door Wrangler from being used for long-distance overland travel when there’s more than two occupants. When you’re traveling alone or with one other person, you can fold the rear bench seat to reveal 36.9 cubic feet of space or it can be removed completely, in which case you’re pushing 50 cubic feet! We set out with the goal of making this fun, yet small vehicle, functional for four people to use for long trips as well as the everyday commute to work. 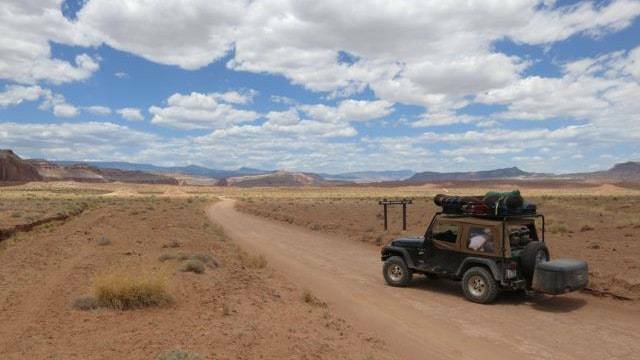 The ultimate test would be a route stretching from Arizona to the Canadian border, out to the Pacific Ocean, down close to Mexico and back to Arizona across the desert in 30 days—complete with all camping gear and “stuff” that tends to accompany a family of four. After some extensive searching, we found two products that were just perfect for acquiring the cargo space we needed out the back and up on top. Since our Jeep was equipped with a towing hitch, we began to look for hitch mounted cargo carriers. In the Jeep community it’s quite popular to see flat steel shelves mounted to the hitch that are often loaded with a cooler, a jerry can of water and a bunch of fire wood. These have their place but for our needs they were too heavy for their size, too small and they leave all of their contents exposed to the elements—and more importantly, theft. With more digging we began to find hitch mounted boxes that ranged in size from seven cubic feet all the way up to sixteen cubic feet. That was simply too big for us and the smaller ones had inefficient designs that wasted space. We almost went with the Tail Gater because it breaks down to create a picnic table and two bench seats for camp but at 8 cubic feet the volume was small. In the end we decided on the Rola Adventure System, a 13 cubic foot roto-molded plastic case that mounts on top of a platform made of the same durable material. The lid only takes up the very top of the box, allowing for more usable storage space and the enclosed box can even be removed from the platform if you need to haul bulkier items like firewood or bicycles on the flat shelf. Two versions are available, a swing-out mount for swing-out rear doors or a fold-down mount for hatchbacks. The lid has a foam filled groove to minimize dust inside the box and the lip of the lid prevents rain and road spray from entering. For security there are four locks, two hold the box to the platform and two lock the lid in the closed position. It’s interesting that the locks were the only part of the system that didn’t seem to fit the overall quality. They began to have issues after just two weeks of being locked and unlocked 5-10 times a day. Only six weeks later, the two locks on the lid had completely given up and one of the locks securing the box to the platform became permanently locked. We replaced the two top locks with a couple of beefy strap locks from the hardware store for an improvement in security and function. – One random bag of fishing gear, flashlights, bug spray etc. The Rola Adventure system has proven to be an indispensible additon in makin gthe 2-door Jeep more functional. 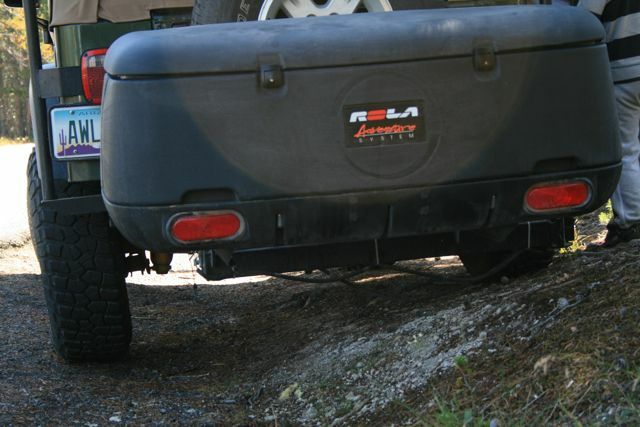 We have also added a WARN rear bumper with an integrated hitch receiver. The resulting 8″ of additional clearance under the Rola box has regained a reasonable departure angle. The challenge in mounting a roof rack to a vehicle with a soft top is simple, there’s no solid roof to mount to. 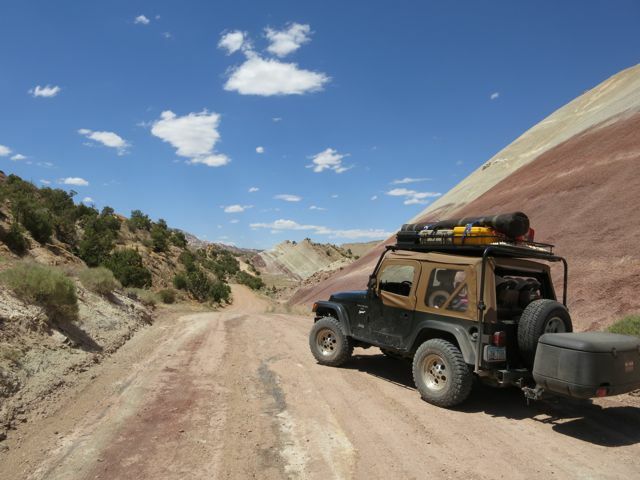 There are several TJ roof racks on the market that simply mount to the sheet metal of the body. The long term durability of mounting a heavy roof load to thin sheet metal is less than ideal for rough terrain. 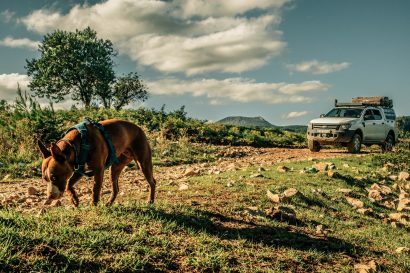 The Dave’s Rack Roof Rack is supported by four legs, the two front legs attach to the base of the A-pillars and the rear legs mount to the vehicles frame with a stabilizing arm that mounts behind the tail lights. Once assembled I found that there is little to no play in the rack. Tugging on any of the legs or the top platform the solid connection becomes evident as the Jeep rocks back and forth. The floor of the rack is made from several one-inch round bars running from front to back. The basket is made from ½ inch square bars and stands about five inches above the base of the platform, and the basket is easily removable if you want the flat platform only. The only real drawback that we found with the Dave’s Rack was the space in between the bars that make up the floor. The dry boxes and dry bags we were using would fall between the bars if not placed just right. As a permanent solution we will be using some lightweight plastic kennel flooring when needed. Olympic 4×4 makes several models, however the Dave’s Rack is unique in the way the top platform can fold up and backward with legs that drop down to create a sun shade canopy behind the vehicle. So, GET OUT AND EXPLORE! Regardless of what you may see as limitations there are usually simple solutions that will get you out the door.